We get asked, “when are you gonna make a firefox extension” a lot – by potential investors, partners, and customers. GASP! Yeah, that’s right. 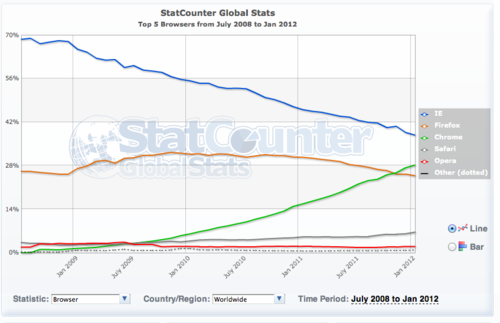 Unless something drastic changes in the chart below, ideally we’d like to never make a FireFox extension. There’s one simple graph and one not-so-simple reason. Chrome made big news when it finally became the biggest non-IE browser. But FireFox is no joke – that’s quite a big chunk, and FireFox’s population is reputably big on extensions. So why in the world do we say we’ll do Outlook before we think about Firefox?? Isn’t FireFox the world center of extensions? Early adopters? When we look at this graph, we don’t look only at the absolute numbers. We look at the trends. Yes, Chrome is going up and FireFox is going down, but again it’s not the future of the absolute numbers that we’re excited about either. FIreFox has been the classic go-to platform for browser extensions for a simple reason: “that’s where the adopters are.” That’s where you’ll find people who look for technology that can solve their problems. And when we look at this graph, we intuit that the people who gave FireFox its fantastic reputation for extensions and its active community – well, those people, they’ve moved to Chrome. And we’re not totally guessing. The Chrome store was clearly gettingenormous traffic even before it made big changes to its design and distribution. And we intuit that the people still left on FireFox will disproportionately include those who were late to the party to begin with. Parents, grandparents, schools, university computers. In short, not Ecquire’s target customers. So, we think there’s going to be a long way to go before we run out of potential customers in the Chrome store. We’re glad we hitched our wagon to Chrome first, not just because of user quantity, but because of quality. *If you do use FireFox/Safari and really really want to use Ecquire, our install process will automatically suggest you install Chrome. ** One day, when we exhaust all market segments and have nowhere else to grow, maybe then we’ll do a FireFox plugin. Even then, we’re much more likely to do an Outlook plugin first. Interesting article and disappointing. We are ready to ditch Chrome entirely and find the extensions and browser crash a lot- to the point they are ineffective, a hinderance to business. The email interface is chrome is also awful and we have a lot of problems with our beloved ecquire in chrome! Joe, I get what you are saying but you are missing the point. Listen to what people want. I have to use Firefox for a number of applications and am using Chrome less and less because I don’t trust Google. Not having an extension for Firefox is insensitive to the paying customer. Thanks, Greg. If we could turn firefox on and make sure the customers using it would have a good experience, we would do it in a second. We cannot ensure that experience however as we don’t have enough people to put on it. We elected to go with chrome for the adoption rate it has shown and the growth of businesses moving to google apps. It became a question of what could we be the best in the World at and provide the best experience. That decision, unfortunately, comes with having to turn down other opportunities. I’m really sorry about the inconvenience for now.